Properties in Ho Chi Minh City average 4.4 out of 5 stars. 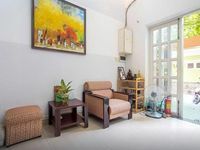 The place is quietly tucked away and very near to pham ngu lao and benh thanh market. It is very easy to go around. The room is nice with amenities such as a stove and fridge. The aircon is not strong during the day, but at night it is ok. Place is clean and host is so friendly. I had a lovely stay.